Korean cooking is commonly described with five different Korean words (jjayo, salty; shida, sour; ssuda, bitter/acidic; dalda, sweet; maepda, spicy) because the cuisine encompasses the amalgamation of these five bold characteristics. Because of its memorable flavors, Korean food can be easily described as addictive. 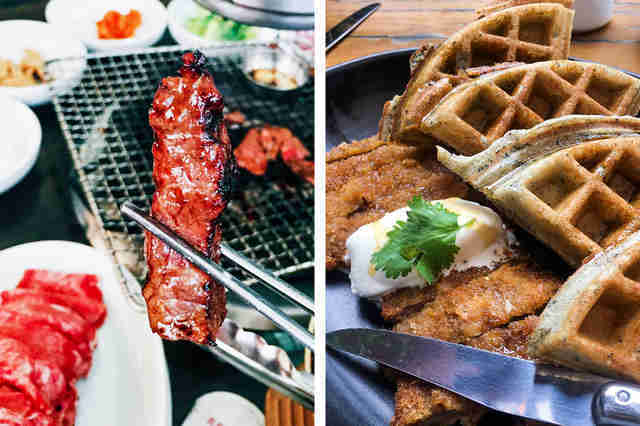 Although Korean food is mostly known in the US for its chicken wings, kimchi, and addictive barbecue, chefs all over the country are using Korean ingredients and cooking techniques, and even fusing Korean dishes with, say, Mexican flavors, to expand the horizons of Korean food. 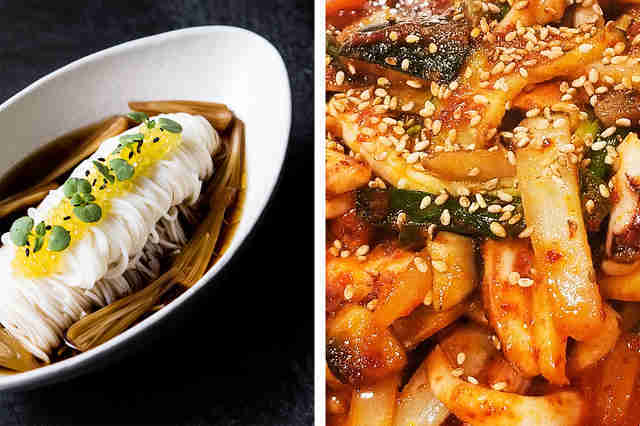 Here are the 21 Korean restaurants worth visiting asap. 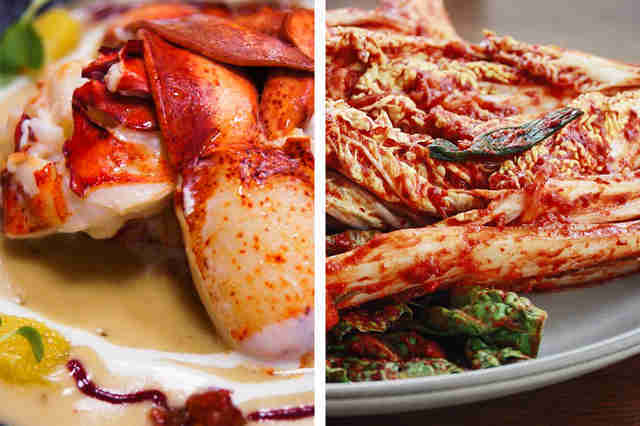 Jungsik was the second Korean restaurant in the United States to receive a Michelin star and one of the first “haute” Korean establishments in New York. Today, the restaurant has not one, but two Michelin stars. Chef and owner Jungsik Lim uses the skills he picked up cooking at high-end restaurants in Spain to create a menu that combines traditional Korean flavors with European culinary sensibilities. The result? Dishes like a five spices sous vide samgyeopsal (pork belly) and yookhwe bibimbap (wagyu beef tartare on rice with gochujang, a Korean fermented chili paste). In Korean, ssam essentially translates to "meat wrapped in lettuce." Girin does just that and much more. Celebrated for their tteok or dduk (rice cakes) which are made in-house, banchans (side dishes), and their high-quality and responsibly sourced meats, Girin celebrates local producers and generations of Korean home-cooking traditions. 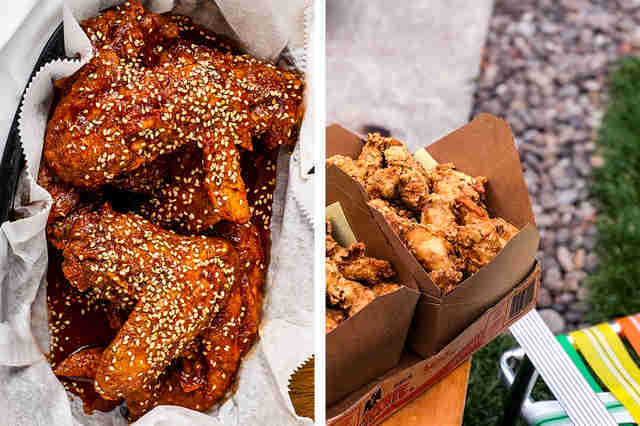 On Mondays, they also offer Korean fried chicken, but be warned, they often sell out. Oiji proudly claims to offer “Refined Authentic Korean” food. Chefs Brian Kim and Tae Kyung Ku take classic dishes like jang jo rim (soy-braised beef with hard-boiled egg) and haemul nurungji tang (seafood broth with crispy rice) and offer up modern twists like adding a scoop of butter rice to the former and shaving truffles onto the latter. But perhaps their most well-known dish is the honey butter chips. The "honey chip" trend exploded in Korea in 2015 and it was nearly impossible to get your hands on a bag of these sweet-and-salty chips. Head to Oiji and you'll find a stellar version served with vanilla ice cream. When you ask Koreans and Korean Americans in Seattle where their favorite Korean food restaurant in the region is, many will answer with Sam Oh Jung. Established in the mid-1990s, Sam Oh Jung is a traditional Korean restaurant that is easy to miss if you aren't looking for it -- the restaurant sits in a nondescript strip mall in Lynnwood, a city located 16 miles north of Seattle. They are known for their gejang, or raw crab in soy sauce, but they also offer traditional Korean offerings such as haemul pajeon (Korean green onion seafood pancake) and gamjatang (pork bone stew with potatoes). Voted Portland’s Restaurant of the Year by The Oregonian and Portland Monthly in 2017, Han Oak is a Korean-American restaurant named after traditional Korean homes called hanok. Chef Peter Cho brings guests homemade Korean food in his literal home; his family lives in the same building and guests can often see his child roaming around. While the noodles and dumplings are great, don't skip dessert. Cho serves up a castella, or Japanese sponge cake, which is a sweet dessert enjoyed by many Koreans around the world, and this version comes with an Oregon twist -- peaches! To many Koreans, sul lung tang/seollongtang (a milky bone broth) is comfort food. As adults, they turn to this bone broth as a hangover cure. Located in LA’s K-town, the restaurant opens every single day at 7am, for both their breakfast guests and the hungover crowd. They only have two things on the menu: bone broth soup (with your choice of meat) and boiled beef. Customers are able to customize the bowls of soup to their liking by adding in as little or as much green onion, salt, and black pepper as they like. The soup is best enjoyed with a bowl of rice and generous portions of kimchi. Crisp is most famous for its Korean-style chicken wings -- especially for its Seoul Sassy wings. Made from a family recipe that uses ginger, soy, garlic, and spices, the recipe has been passed down for generations. The thing about Korean-style chicken is that it’s breaded in a special way, making the skin of the chicken mixed with the batter incredibly crispy and flavorful. True to the restaurant's name, the wings are crisp. 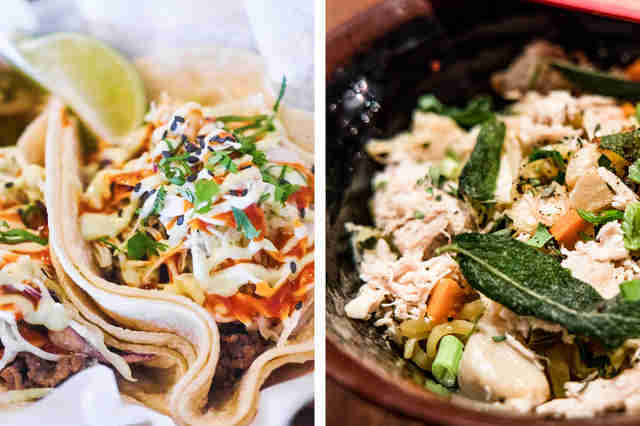 In addition to deep-fried chicken, they also have Korean burritos and rice bowls to round out the menu. When you ask chef Kevin Doil Lee at Makani if the food he offers is Korean, he will tell you it’s Korean Angeleno. Using inspirations from his upbringing in both Korea and US, Lee’s menu is filled with new and exciting Korean-inspired plates such as Eggplant and Nurunji (Korean rice puff chips), Mung Bean Jeon (Korean bean pancakes but served with aioli), and Buttermilk Fried Pork Ribs which are served over a spicy macaroni & cheese infused with kimchi. Honey Pig is the perfect place to come with your family for no-frills Korean barbecue; it is also the perfect place to come and drink with your friends (many locations are open until 4am). The great thing about the chain's restaurants is that they feel no different than a casual barbecue joint in Korea, with K-pop blasting in the background and walls covered in metal decor. While the meat is great, perhaps the most exciting dish is actually made of rice. When a table is done barbecuing, an employee will ask if guests want rice and vegetables cooked in the leftover meat juices. The only reasonable answer to this question is "yes." Her Name is Han celebrates what it calls “Korean soul food,” or nostalgic Korean home cooking. Here they do things a bit differently, frequently deviating from tradition. For example, the bibimbap comes with farro instead of rice, the japchae (glassy sweet potato noodles) comes with the non-traditional topping of clam (japchae is usually served vegetarian-style or with bulgogi beef), and the bossam (slow-cooked pork belly) comes with unique sauces such as kimchi and berry wine and jalapeno soybean paste. Although all their dishes are done differently, the strong Korean flavors remain familiar. Brother’s is a family-run restaurant that has some of the best marinated kalbi, a Korean cut of ribs, in the country. Here they use charcoal to grill the meat rather than gas, so the atmosphere is a bit smokey. Make sure to also order the soondubu (soft tofu soup), which arrives piping hot to the table to round out your meal. You will leave smelling like smoke and garlic, but you will be full and happy. 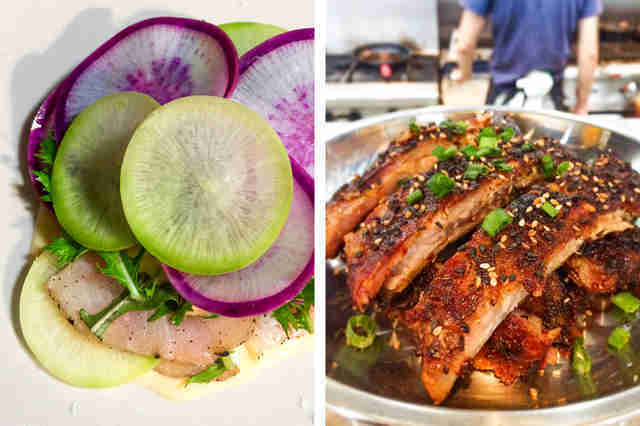 Chef Susan Yoon and co-owner Jason Kim have created an exciting modern Korean menu at this Silverlake establishment. The interior of the space is modeled after a cozy treehouse and the food often reminds Korean guests of the food their mothers made them. For example, the Grilled Mushroom Ssam comes with puffed rice -- a childhood favorite for many Koreans. And their take on ddukbokki (Korean spicy rice cakes), comes with crispy pork belly, cheese, and peaches. For dessert, their misugaru (traditional Korean grain powder) tiramisu is a solid choice. In Korea, most predominantly in the port city of Incheon, there is a large Chinese-Korean community that has been there for generations. 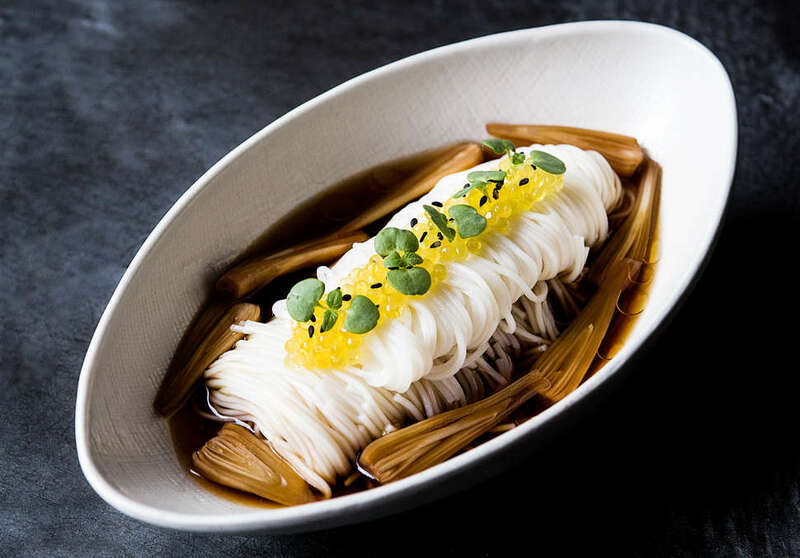 They have been so influential in Korea that today, Koreans often consume Chinese-influenced dishes like jjajangmyeon (black bean noodles) and tangsaeyook (sweet and sour crispy pork). The best place to enjoy this heavenly marriage of Chinese and Korean food in the US is Young King. Their take on kampong shrimp (fried shrimp in a sweet glaze), jjambbong (spicy seafood noodle soup), and ggot bbang (steamed flower rolls) are quite memorable. They have large portions and all their tables have a Lazy Susan so you know there will be enough food to go around -- literally. Coreanos, Spanish for "Koreans," is beloved in Boston, and for good reason. Here they offer Korean-Mexican (also known as “KoMex”) cuisine, a fusion style that first started in Los Angeles. Their Fritas, their version of house fries, come loaded with kimchi made in-house, cheese, and a perfectly cooked fried egg. People flock here for their tacos with Korean-inspired meats such as bulgogi, as well as the kimchi quesadilla, but you can’t go wrong with anything on the menu. If anyone can make Southern-inspired Korean food happen, it’s chef Edward Lee. At MilkWood, the menu changes frequently but you will almost always find a Korean fried chicken which comes smothered with gochujang (Korean fermented chili paste) and served over a pandan waffle. Don't skip the tartare either, which is bulgogi-flavored and sprinkled with coconut sambal and kimchi. Almost everything on the menu celebrates Asian flavors, especially paying homage to Lee’s Korean heritage. Parachute is a Korean-American restaurant with one Michelin star that is most famous for their Baked Potato Bing Bread, a spud-heavy take on the beloved flatbread. This version is stuffed with potato and studded with bacon. The menu changes almost daily with husband-and-wife chef duo Johnny Clark and Beverly Kim constantly creating new dishes inspired by Korean favorites. Take for example their mandoo (Korean dumplings) which comes stuffed with soondae (Korean blood sausage), a filling and fun riff on a very popular Korean street food. Did we mention that Beverly was on Top Chef? When you ask locals about Gaja, they will often throw around the words “young” and “hip.” The family run-restaurant offers traditional Korean favorites such as Korean fried chicken and kimchi stew but they also have items with a Southern twist, such as the hush puppies which are served with a side of kimchi mayo. The cocktails, which use Korean ingredients like soju and Biofeel yogurt (a Korean yogurt drink), pair perfectly with their food offerings. Joule is a Korean steakhouse created by chefs Rachel Yang and Seif Chirchi. Here, they blend their classical French training with punchy Korean flavors, which means dishes like sweet corn with miso butter and cumin furikake and yellow curry pickled beet. Their short rib, served with grilled kimchi, is so well known that they call it “That” Short Rib on their menu. And for brunch lovers, there is something special on the menu too: The sesame waffle, which is only served on weekends, is a good choice if you have a sweet tooth. If you've ever been to Korea, there is no doubt that you at some point encountered a pocha, a Korean drinking tent. Just like at a pocha, here at Gabose Pocha, they offer Korean small plates and Korean drinks. The owners here wanted to create such an authentic experience that they even fly the seafood over from Korea. Their take on boodae jjigae, commonly referred to as "army soup," is an interesting concoction that comes with Spam, instant ramen noodles, and canned beans. It’s a popular dish in Korea that was commonly consumed by soldiers who were given rations of food from the US army. At Gabose Pocha, the soup comes topped with melty cheese. And because it is a drinking tent after all, you can't skip the soju, Korea's national drink. The restaurant has plenty of versions they infuse with fruit themselves. 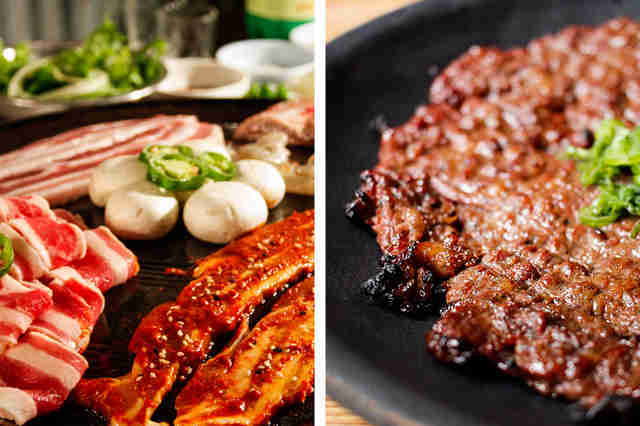 Hobak Korean BBQ is the first US location for the famous global barbecue chain with locations mostly in Asia. 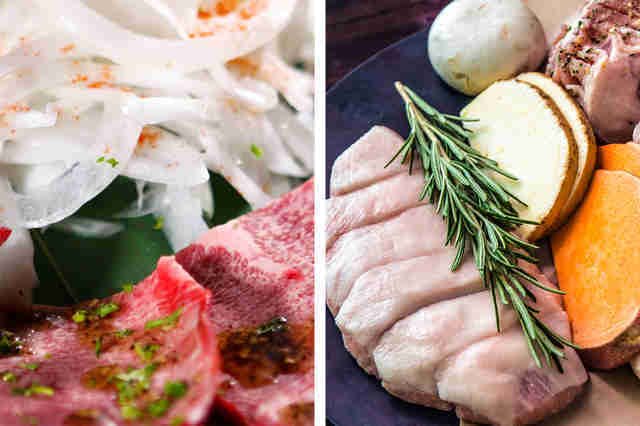 Although hobak in Korean means "pumpkin," here they offer high quality pork and marbled beef. Your meat order comes with daenjang jjigae (soy bean paste stew) and banchans, or several small side dishes. Their Hobak Rice Box which is filled with rice, Korean lunch meat, and a fried egg, comes served in a metal tin, reminiscent of the dosiraks (Korean lunchboxes) that our parents used to take to school way back in the day in Korea. Make sure to end your meal with a complimentary dessert, either a scoop of popcorn ice cream or an ice cream sandwich with a Korean twist. 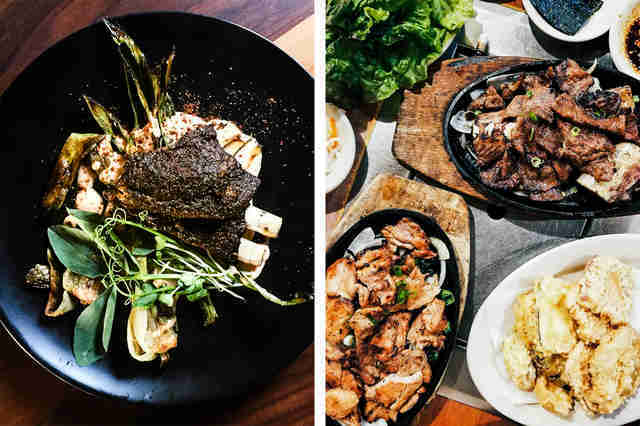 Many places in Los Angeles offer Korean barbecue, but few offer Korean barbecue with a side of 23 types of banchan, Korean side dishes, that come with unlimited refills. Genwa prepares everything fresh and in-house. Guests flock to their locations around Los Angeles for high-quality meats, delicious stews, and their pillowy soft gaeran-jjim (steamed egg). Eileen W. Cho is a Korean American photographer and writer based in Paris, France. You can see her latest work at www.eileenwcho.com or follow her on Twiiter, @eileenwcho, or Instagram @yo_cho.